Managing incidents involving animals nearly always adds an element of uncertainty and danger. The safety of First Responders is at the core of all training. Training includes animal behavior, safe handling, lifting large animals, and involvement of veterinarians. Training is provided to First Responders free of charge. 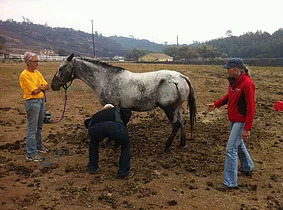 The odds of a positive outcome in any animal emergency or disaster situation are significantly improved if there is a Veterinary Professional, who has been trained in trauma and rescue, on scene. The Veterinary Professional can provide critical services, such as sedation or medical triage, to both further the safety of First Responders and guide best outcome for the animals involved. Educated volunteers provide much needed breadth to emergency response. We would love to have you on the team! Trained team members -- First Responders, Veterinary Professionals and Community Volunteers -- allow for a coordinated incident management response that provide the highest level of safety for the individuals responding and the optimum outcome for the people and animals impacted. Trained team members know their roles, understand animal behavior and how to work together safely and most effectively. We are incredibly fortunate to be working with the British Animal Rescue and Trauma Care Association ("BARTA") in development of our training programs and BARTA is providing access to their leadership and e-learning programs to allow us to train our teams here in the U.S.
Are you ready to become trained to support animal rescue and recovery and make a positive impact on our community? Join the team!